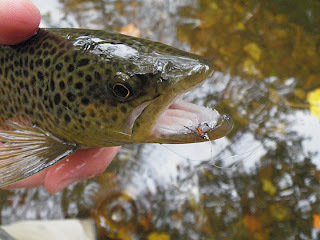 While the Spring holds visions of mayflies on the wing and warmer days, I love Fall fishing for trout. The air and water is cooler and while the hatches are smaller the trout are hungrier. 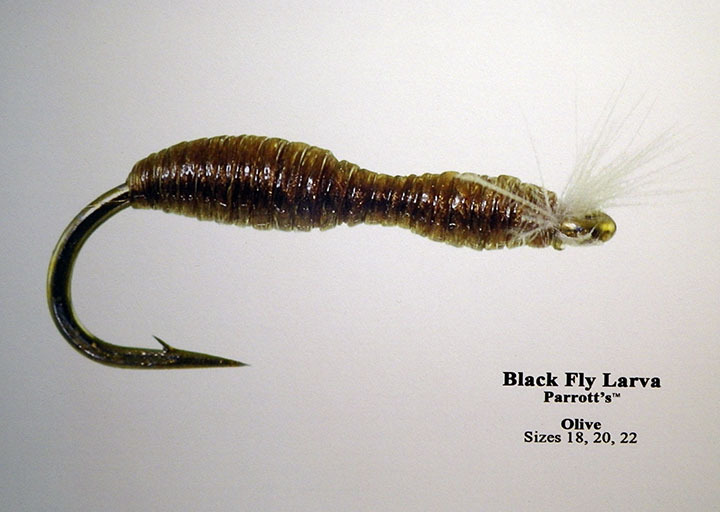 Whether it's to bulk-up for the winter or to have the energy to spawn they want to eat and are aggressive. 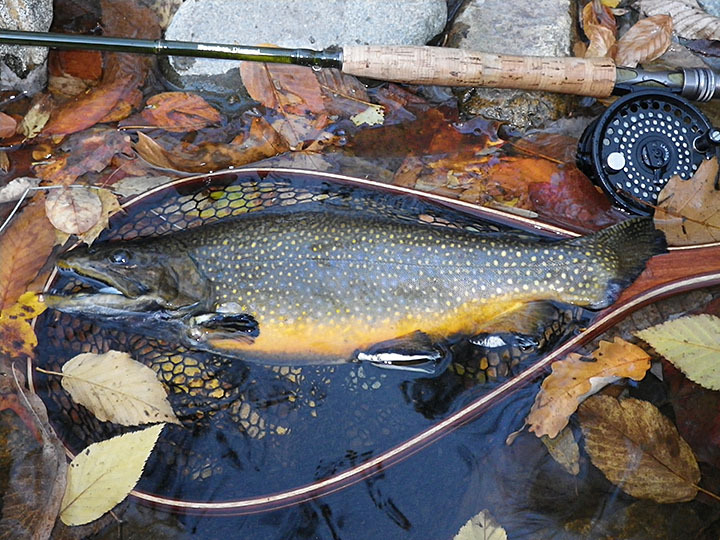 While out several days ago I hook up quite a few Brookies, Browns and Rainbow during the hour leading in to evening. 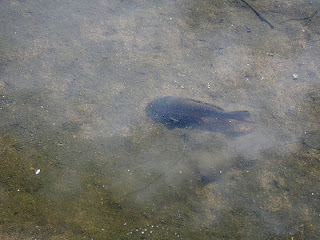 My top produce was by far my CE Crayfish (Close Enough) followed by my The Modeled Leech. 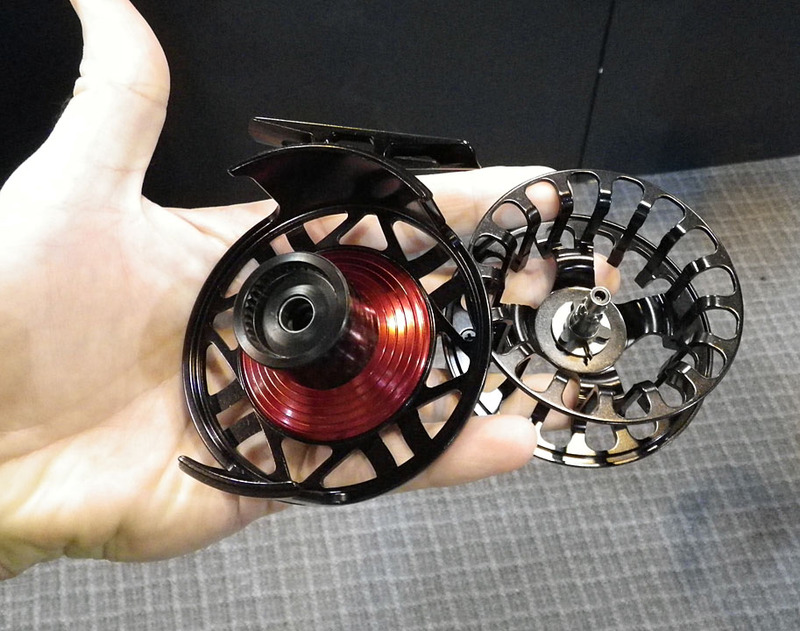 Both are great deep pocket water patterns, I fish them Euro-style casting up stream and lead them down stream with a tight line. 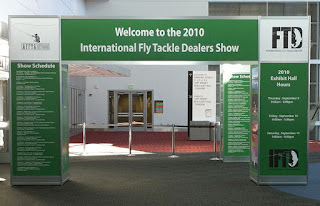 I do impart action to the flies twitching my rod tip, jigging the flies across the bottom. 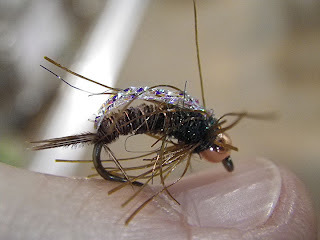 This Bow hammered the Modeled Leech. This weekend I managed to head out and fish (which has become a rare event) weekday seem to be the only time I can get out these days. 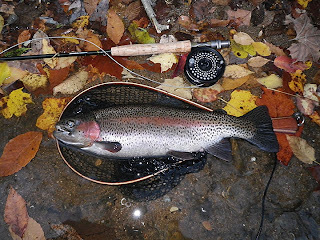 By chance I hook-up with The Jersey Angler and group of friends who where doing it "old school", fishing cane and swinging wet flies. I joined then but without my cane for fear of getting wrangled in to yard work. 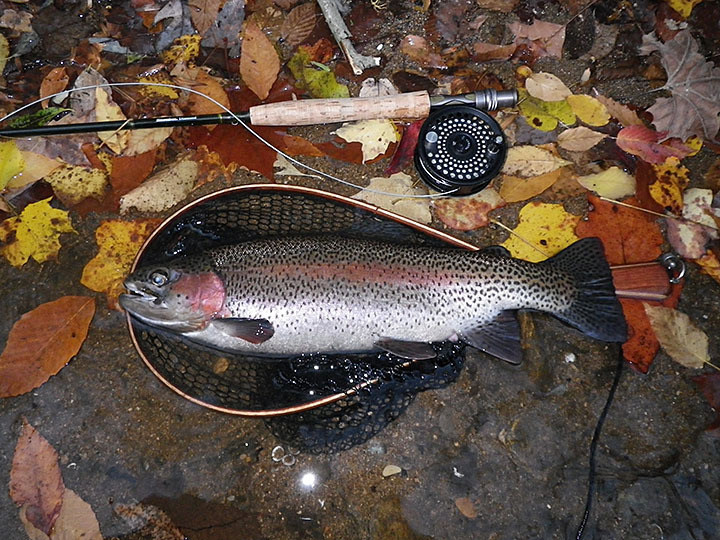 Here is The Jersey Angler breaking in his new cane rod built by Art Port a 7'9", 5 wt with a Garrison taper. 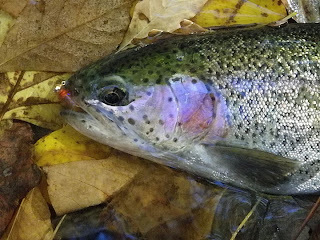 Despite the long line release on the first fish, the day was very productive, go to his Bamboo Day post to see the sweet bow he landed. He handed me the rod at the end of the day and it cast's like a dream. Here are two fill I took in the film. As an active TU member, Director for Central Jersey Chapter and former TU National Leadership Counsel for NJ I get a lot of email from TU National on many cold water, trout and salmon topics. So it's nice to pass this one along, no doom and gloom nor contact your congress person. TU is liquidation it's inventory of gear to raise money and in the process you get a Tax deduction. While we have to stock our NJ streams it's always nice to see and catch stream beard trout. Our water because of summer stream temperatures favor Brown Trout, but we do get natural reproduction of our native Brook Trout, Browns and Rainbow. 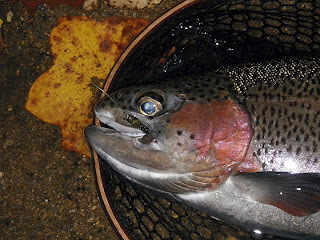 Mind you we need colder temperatures for the Brookies and Rainbows. So why it must be football season (American Football for those across the pond. ), well the photo below should explain it all. This Rainbow one possible two years old that managed to survive predation and anglers. It's been a while since I caught one of the beauties. We all know the phrase and organization "Take a Kid Fishing" how about "Take a Kid Stocking." 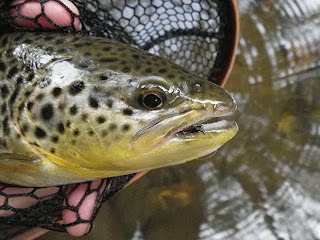 Beside taking my boy's fishing I also take them to stock trout. While we have good hold over and native populations the realty is we have to stock our waters. 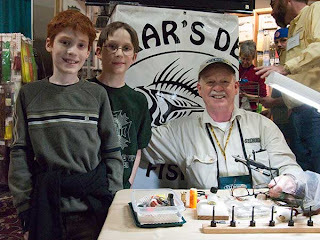 Stocking is fun and teaches them stewardship and it's a great way to spend a few hours with your kids. Make sure if you do this to bring a change of cloths, because the trout are not the only creatures that end up in the river. This time my boys stayed dry. 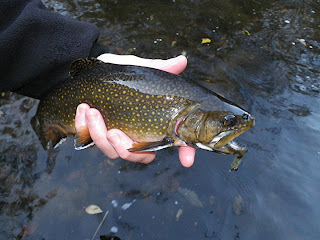 Here is my youngest stocking some trout in a unnamed New Jersey river. 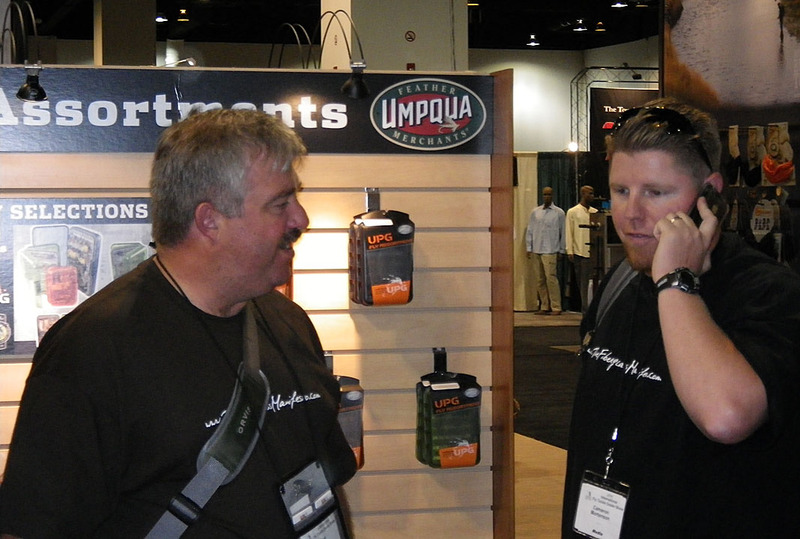 Here is another new pattern from Umpqua Feather Merchants, I think it will be a winner. 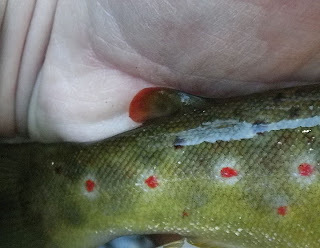 If you've been bitten by Black Flies in the spring while fishing (like I have) than Black Fly Larva are in the water you're fishing. I like it for two reasons: 1. It's a simple tie following the K.I.S.S. 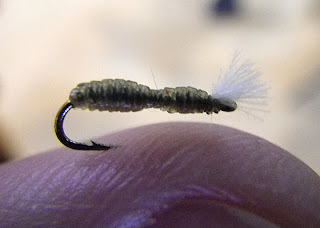 rule; and there are plenty of these buggers in the rivers. I think this will be a winner. Here is the recipe as I see it. 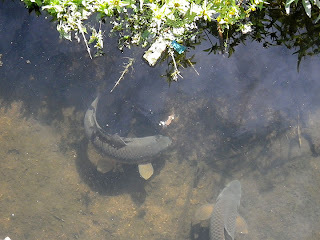 In all we counted about 8 but only one was actively feeding. Of course we were both kicking ourselves for not have packed at least one travel outfit. 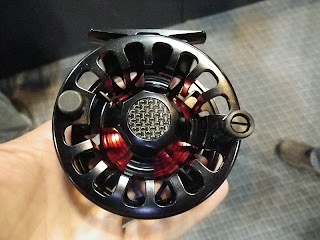 Ross Reels USA/Ross Worldwide Outdoors of Colorado. of a independent designer/manufacture of quality reels and and now rods. 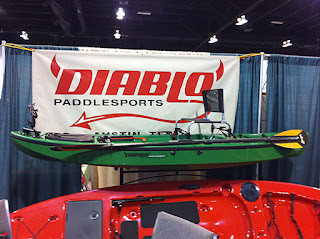 At the IFTD Show I got the chance to look one over and it is SWEET. 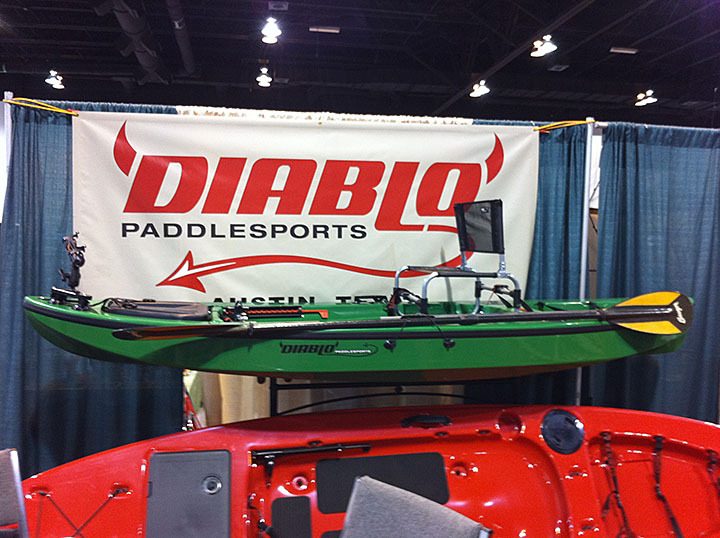 The drag uses breaking technology from Formula 1 race cars. I don't know what Ross Worldwide will look in a year or two after 3M takes over, but I know I pick up my F1 very soon. 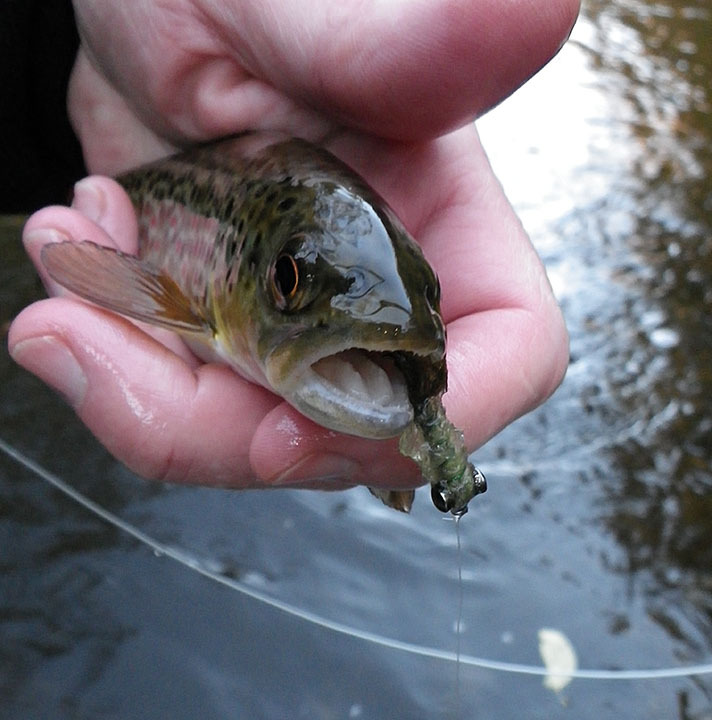 Also I got to try out the New RX Fly rods, this fast action, progressive taper rod was a pleasure to cast. I was very taken with the rod and had to cast it everyday I was at the show to make sure it wasn't a dream.